Rotterdam Mayor Ahmed Aboutaleb has deployed a heavily armed special force unit with permission to ''shoot in case of need'' Saturday as Turkish protestors gathered around the Turkish consulate after Family Affairs Minister Fatma Betül Sayan Kaya was barred from entering the consulate building. The scandal surfaced on Monday as Aboutaleb said that he had deployed heavily armed security officers during a Dutch television program, called Nieuwsuur, which aired on public broadcaster NOS. ''When we first learned that Minister Kaya was heading for the Netherlands by land route, we started to look for the minister's convoy in Dutch motorways. We finally spotted her and followed, blocking her way near the consulate,'' the Moroccan-origin mayor of Rotterdam said. Aboutaleb then explained the arrangement he had made, which could have resulted in crisis between the two NATO countries if a provocation had taken place. ''Consequently, we decided to deploy special unit so that we would have the upper hand if anything were to happen. We also gave them the authorization to shoot in case of need,'' Aboutaleb added. 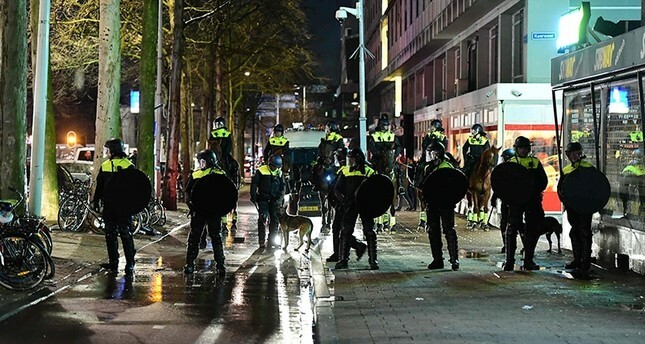 Rotterdam's mayor then tried to blame the decision to deploy heavily armed officers to stop Minister Kaya's peaceful visit to her country's diplomatic mission on Turkey's consul, acting as though he did not cooperate. The row between the two countries escalated after Dutch authorities blocked the family minister's convoy from entering the Turkish consulate in Rotterdam Saturday, following the Dutch government's decision to deny landing permission to the plane carrying the Turkish Foreign Minister earlier that day. The ministers were due to meet Turks living in the Netherlands ahead of the April 16 referendum on the constitutional amendment package.